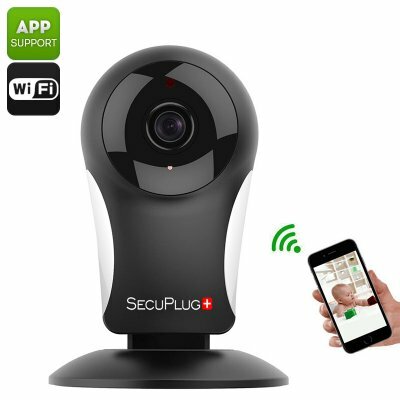 Successfully Added SecuPlug+ SP05 IP Camera - 960P, Wi-Fi, Smartphone App, 960P, Motion Detection, Alarm Notification, Two Way Audio to your Shopping Cart. This IP camera is on a hinged base allowing it to be rotated through 360 degrees and tilted through 180 degrees for easier setup. With its small compact form and Wi-Fi connectivity, this IP camera is easy to place the discreetly on a bookshelf or table top. Alternatively, you can use a couple of screws it comes with to mount the camera on your wall or ceiling. Unlike the majority of IP security cameras, the SceuPlug+ SP05 IP camera doesn't come with a cloud subscription. Instead, you record the video directly onto a micro SD card. With support for 64GB cards, you should have plenty of storage to capture important events when you're out of the house. If you want to record 24/7 footage while you're on a business trip or away on holiday then you'll need to set the camera up with a PC client so you can store the recordings on your hard drive. With the YOOSEE smartphone app, compatible with iOS and Android devices, you can view a live feed from the camera directly on your phone and you'll be able to receive notifications if the camera's motion detection is triggered. The two-way audio lets you hear as well as see what's happening and you can communicate with those at home, even when your miles away. Meaning you can tell Fido to get off the sofa or the kids to stop watching TV and do their homework. The smartphone app is easy and intuitive to use so even if you've never used a home security camera before you'll find this one is simple and easy to control and use. 10 IR LEDs bring night time visibility of up to 10 meters and with IR-Cut the camera will automatically switch between day and night modes once it gets dark. You can use the SecuPlug+ SP05 IP camera as a nanny camera, pet cam, baby monitor, for Skype chats or for home security and surveillance brining you peace of mind to relax when you're not at home. The SecuPlug+ SP05 IP Camera comes with 12 months warranty, brought to you by the leader in electronic devices as well as wholesale IP cameras and surveillance cameras..